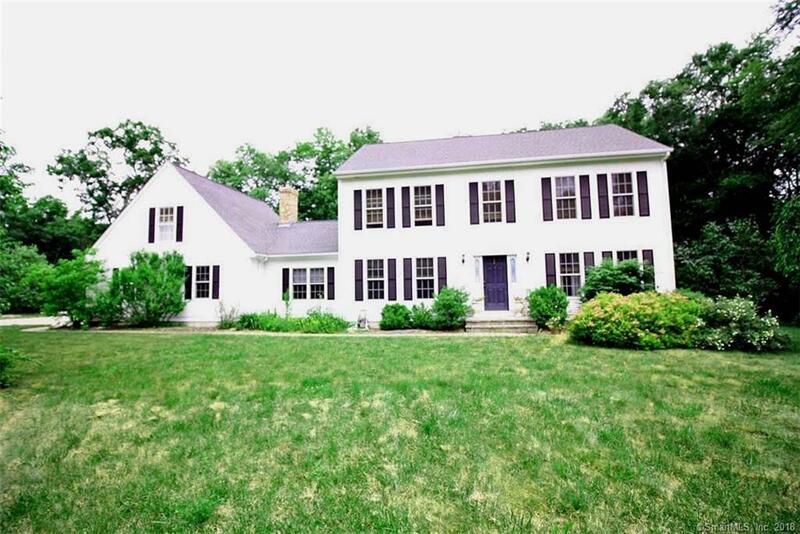 Very spacious Classic Colonial w/over 2,700sf of gracious living space. Foyer w/tile flr leads to the kitchen featuring birch cabinets, beautiful granite counter space, propane downdraft range in the center island, dishwasher, large stainless fridge, a breakfast bar and a large eating area, plus it is open to the vast great rm which boasts a cathedral ceilings, ceiling fan, skylight, floor to ceiling brick fireplace, built in bookshelves and slider door to a huge deck! The two-level deck features non-splintering composite decking (bare feet welcome!) along with vinyl railings so it's virtually maintenance free. 1st flr also boasts a formal Dining room, 1/2 bath w/laundry and 1st flr master w/double closets and full bath. This room is currently being used as another LR area. Beautiful hardwood floors except foyer and baths on both the 1st and 2nd flrs. 2nd floor features another large master w/private bath, walk-in closet and access to the partially floored walk-up attic excellent storage. Two more nice size bedrooms w/ample closets. 2nd full bath w/tile flr, double vanity, tub/shower and linen closet. There is a huge 18x22 bonus room over the garage, accessed by its own stairway off the great room. This room has a skylight, ceiling fan, recessed lights, built-ins, carpeting and plenty room for fun for everyone. A full dry basement, 2 car attached garage and a generator hookup (the generator does not convey) finishes it all. This charming home is a must see property! Listing provided courtesy of Brian Jermainne of Team Jermainne Real Estate Services, Llc.